Hi loves! I did a makeup swap with Cherry! Check out her blog here. She is really fabulous!! 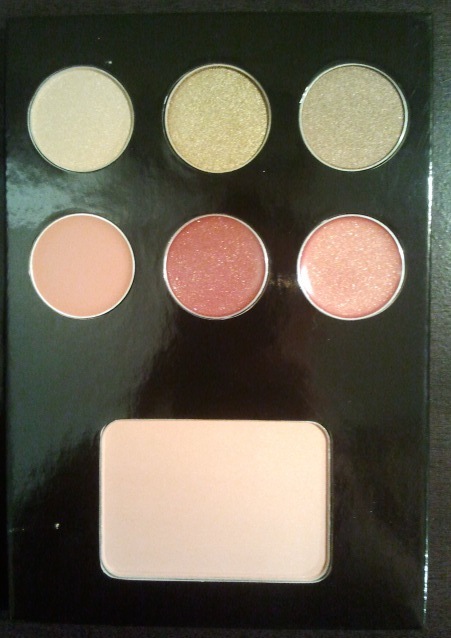 We agreed on a $50.00 budget (plus shipping). 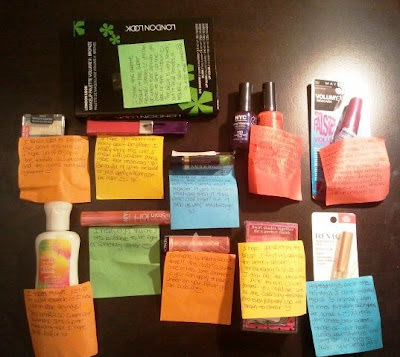 We included drug store items to maximize the number of items we could purchase!! Cherry and I are both Canadians, but we are from different provinces so we each had access to stores which the other does not. Plus, since we are in the same country, the postage wasn't too pricy!! We decided not to give eachother a wishlist and instead just guess what the other person would like by reading through their blog. 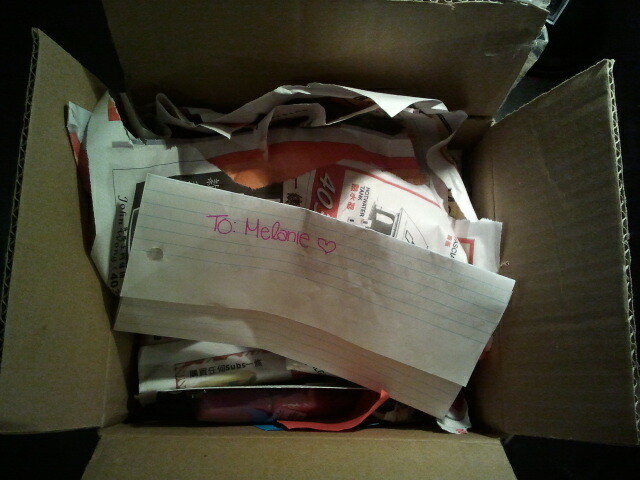 This made the swap extra exciting because we would each receive surprises!! She wrapped the products in tissue paper and then in newspaper, to make sure nothing would get damaged. 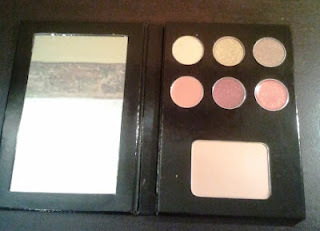 London Look Makeup Palette Volume II: Bronze - This lovely palette has three neutral eyeshadows, three lipglosses and a blush. Rimmel Moisture Renew Creme Gloss in "Fuchsia Therapy" - A pretty bright pink gloss! 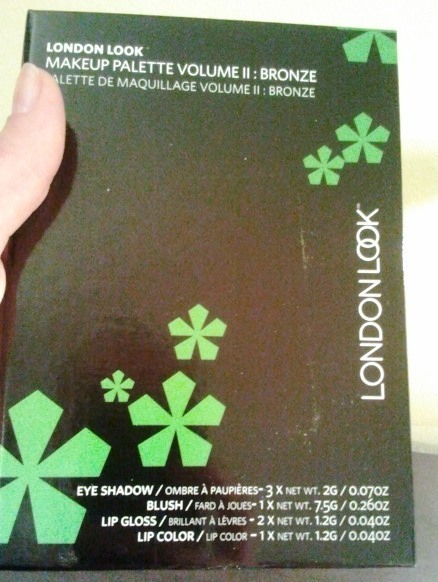 :) I'm excited to try this!! Bath & Body Works "Peach Sparkle" Body Lotion - I love Bath & Body Works!! 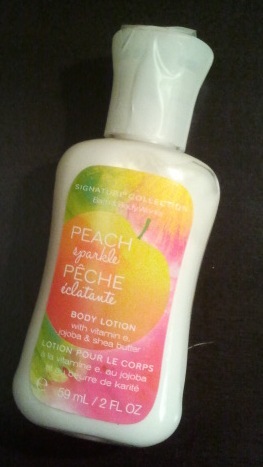 :) I never heard of this scent before though! 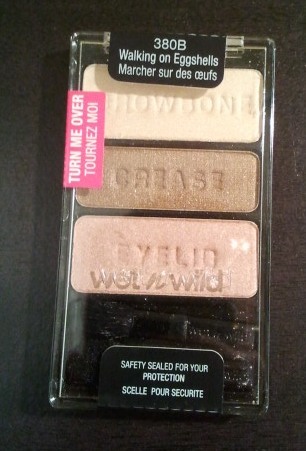 It's really lovely!!!! Perfect for summer! 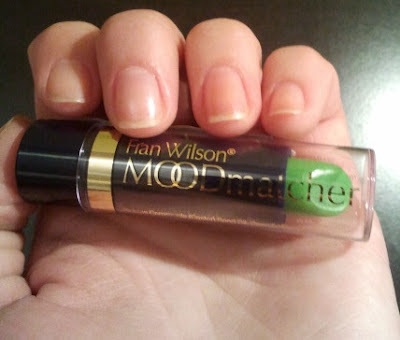 NYC Smooch Proof 16H LipStain in "Champagne Stain" - I have a few lipstains and I do enjoy them, so I'm excited to try this! 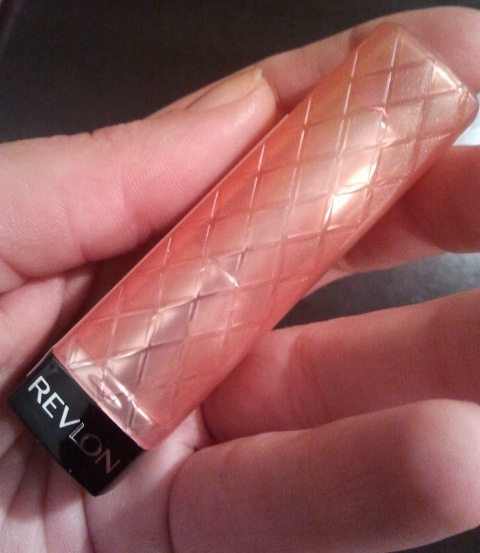 Revlon Colorburst Lip Butter in "Peach Parfait" - I have one of these and I like it! I'm glad Cherry got me a second one! 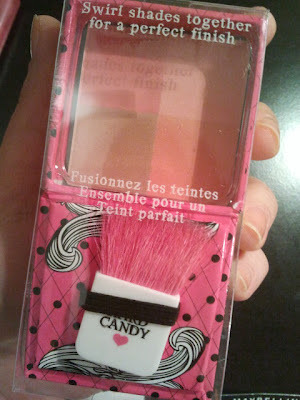 Hard Candy Fox in a Box Blush in "Sweet and Spicy" - Cherry said this box is a lot like the Benefit boxed blushes. How cute! Revlon Highlighting Stick in "Golden" - I love highlights! 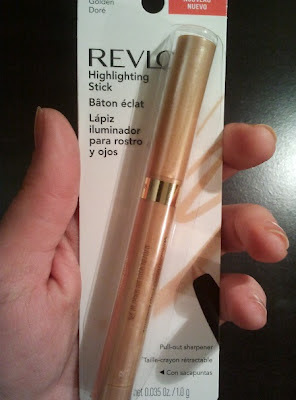 I've never heard of a highlighting stick before, but this looks fun! 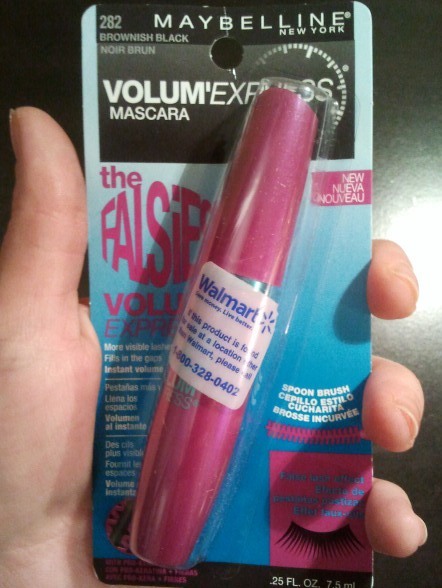 Maybelline Volum'Express the Falsies Mascara in "Brownish Black" - I've tried this mascara before and it's a great one!! NYC Long Wearing Nail Enamel in "Purple Pizazz" - Cherry knows I LOVE nail polish! 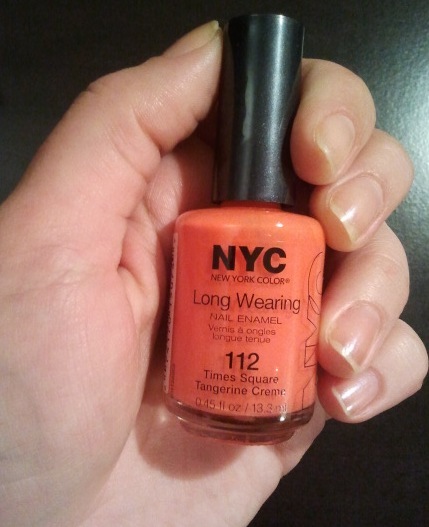 NYC Long Wearing Nail Enamel in "Times Square Tangerine" - What a great summer color!